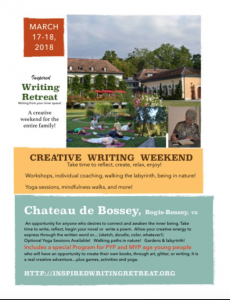 Come and join us for an Inspired Writing Retreat and boost your creativity – not only for writers, but for anyone who wishes to connect to where the words come from, and write from within. 17-18 March, bring your children and get -20% for them and yourselves. Wonderfully creative Children’s program ages 6-12 (teens can choose to join the main program).